There was once a prince named Jonathan. Jonathan lived in the king’s house. His father was the king. Jonathan dressed like a prince. He wore a fine robe. 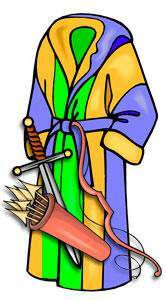 His robe was fastened with a beautiful belt or girdle. A fine sword hung at his side. He had a bow and arrow with which to shoot. Jonathan looked like a prince. And he was a good and kind prince. Everybody loved Prince Jonathan. Every day there came to the house of the king a shepherd boy named David. 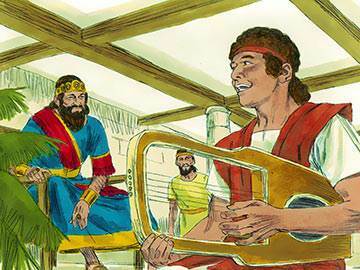 David came to play his harp and to sing for the king. The king loved to listen to David’s music. No one could play such beautiful music as David. When he was through playing, David would go home again to take care of his sheep. One day David the shepherd boy did a very brave thing. He saved the king’s soldiers from a tall giant. Everybody talked about how brave David was. The king was very much pleased with David and had David brought before him. 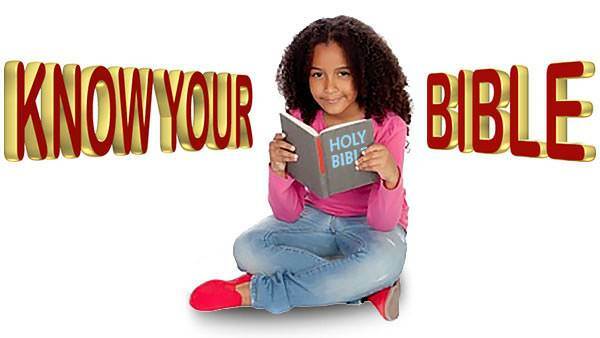 “Whose son are you?” he asked the shepherd boy. “I am David, the son of Jesse,” answered the boy. Then the king told David that he wanted him to come and live in the king’s house always. So David the shepherd boy came to live in the king’s house. But David was not a prince. He did not have a fine robe to wear. He had only his shepherd’s coat. He did not have a prince’s girdle. He did not have a sword to hang at his side. He did not have a bow and arrow. Prince Jonathan saw all this. He loved David as if he were his own brother. And he wanted David to feel at home and be happy in the king’s house. 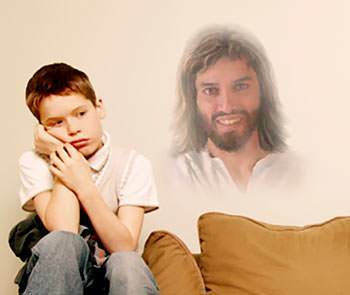 “I can do something to make David feel at home,” thought Jonathan. So he came to David and he took him by the hand. 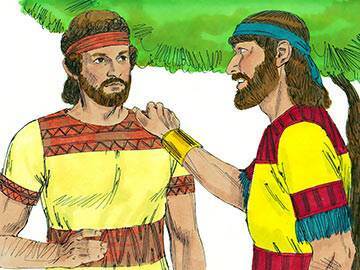 Of course it made David happy to know that Jonathan wanted to be his friend. Then Jonathan saw that David had no fine robe. Everyone in the king’s house wore fine robes. So Jonathan took off his own robe and put it on David. He fastened it with his prince’s belt. But David had no sword. 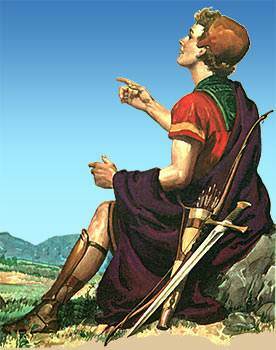 So Jonathan took his own sword that he loved and fastened it at David’s side. 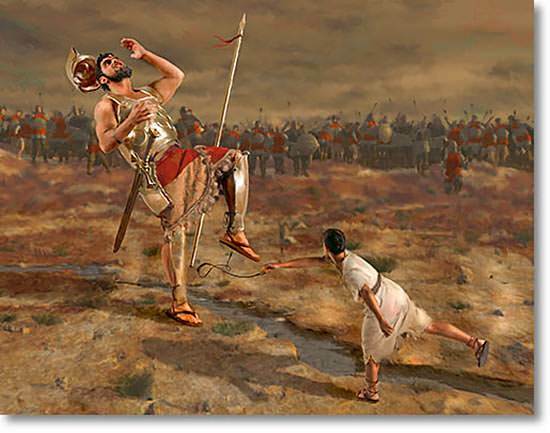 Then he gave David his bow and arrow. And now David looked like a prince, too. With such a friend as Jonathan, David could not help being happy in the king’s house. Jonathan and David loved each other very dearly. They had many happy times together. 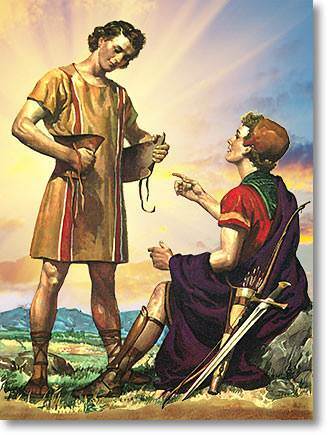 David never forgot Jonathan’s kindness to him when he was a lonely shepherd boy. You too may feel that you are alone at times, but just remember that you have a friend that sticks closer than a brother and that is Jesus Christ. Often when young people are lonesome for a friend they will go off and choose someone that is not good for them. They do this because they feel they can’t wait for God to bring along the right person. It is better not to have a friend than to have the wrong one. The kind of friend you and I need is an unselfish friend like Jonathan was to David. In order for us to find such a friend we will need to learn to be unselfish ourselves. The way to do this is open up our hearts to the Lord and ask Him to show us when we are selfish. I know if you will wait for God’s timing, He will bring along the right friend for you.